Order one for each MA office and location to be fully compliant. 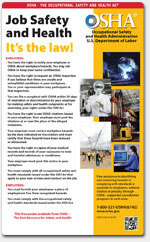 The OSHA poster is included on the Massachusetts Complete Labor Law Poster. When you order the Massachusetts Complete Labor Law Poster, it will satisfy your State, Federal, and OSHA posting requirements with one poster. 03/2019 - Massachusetts Paid Family and Medical Leave - New poster with information about the Massachusetts Paid Family and Medical Leave Law and who is covered under this law. 10/2018 - Minimum Wage Poster - Updated with the new 2019 minimum wage of $12.00 and several minor clerical changes. 12/2016 - Minimum Wage Poster - New additional information includes pay deduction law, addition of pregnancy and gender expression as protected classes against discrimination, new rules on reporting pay, and domestic workers' right. 01/2016 - Minimum Wage Poster - Updated with new information on Earned Sick Time and Equal Pay Law. Removed old 2015 minimum wage rate and now only shows 2016 minimum wage rate and future 2017 increase. 10/2015 - Unemployment Insurance - Update to Unemployment Insurance poster, revisions mostly consists of minor reformatting to existing texts. 05/2015 - Discrimination - Update to Fair Employment poster, changes includes new contact numbers, new category of protection for domestic workers, new parental leave act guidelines, etc. 03/2015 - Parental Leave Act - Updated with minor content change and reformatting. 10/2013 - Discrimination Notice Poster - Update to the Fair Employment Law in Massachusetts states that the law applies to private employers with 6 or more employees, includes "Gender Equality" as a protected class, adds a website where discrimination charges can be filed and two new office locations in Worcester and Bedford. 06/2013 - Unemployment Insurance Poster - Update to Unemployment Insurance panel, very minor verbiage changes to instructions on how to file. Many industries such as the restaurant, retail, construction, and professional use the Massachusetts Complete Labor Law Poster to satisfy their compliance requirements for State, Federal, and OSHA. When posted in an area frequented by employees, the Massachusetts Complete Labor Law Poster puts a business in full compliance. Federal contractors and subcontractors are required to display more postings in addition to the general State, Federal, and OSHA regulations. Please click here to see the federal contractor and subcontractor posting requirements. Ensure your full compliance by posting the Massachusetts Complete Labor Law Posters with the federal contractor-required postings.